Bertha continues to deepen rapidly. NHC has brought the winds up to 115 mph on the 5 pm update - a major hurricane. The wind estimate could still be conservative. The forecast continues to call for a turn and recurve east of Bermuda. The turn is now very apparent of the satellite imagery. Bertha is moving northwest over the past several hours. 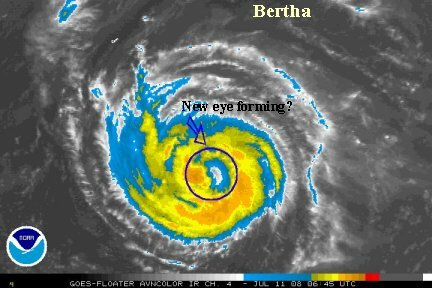 Interests in Bermuda should follow the progress of Bertha. 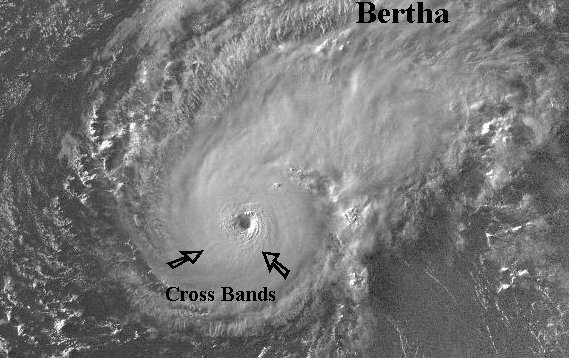 Bertha is a smaller than average hurricane. This will help in terms of swell generation. Most people ( other than surfers ) do not appreciate large swell which can flood low lying areas and cause beach erosion. The smaller the wind field of the hurricane, the smaller the swell generation in general. The next update will be early AM Tuesday. Just noticed some of the perpendicular banding taking shape. This is sign of rapid deepening. NHC's official forecast keeps Bertha at 115 mph through tonight then slow weakening. With the look of the last few satellite pictures it may actually still strengthen before the anticipated weakening starts. NHC did bring the winds up to 120 at 11 pm. The max winds were probably around 125-130 earlier this evening as mentioned by NHC and we agree. The eye wall temps are warming considerably. Bertha is most likely near 100 mph. Look for a reduction in wind speed at the 5 am advisory. The forecast models generally still take it east of Bermuda. The steering winds will become weaker later this week, so Berta may slow way down for a day or two. NHC did not bring the winds down at the 5 am update. We don't believe that the satellite imagery supports a 120 mph sustained wind speed. 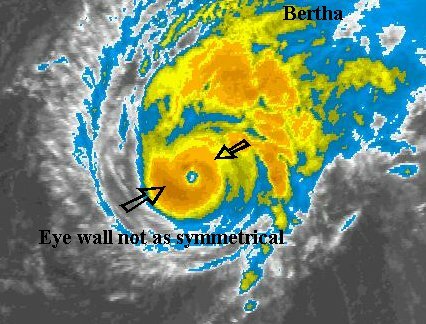 The eye wall is not symmetrical and their is evidence of shear taking place. The same winds that are now turing Bertha. I was talking to a colleague who was a hurricane forecaster at NHC for many years, and he concurred about the strength not being nearly 120 mph. Bertha is near 21.6 N and 53.4 W or about 1020 miles southeast of Bermuda. Bertha is now moving north-northwest as of the latest satellite imagery. Our estimate of the wind speed would be near 100 mph - maybe less soon if the shear disturbs the eye wall more. The forecast models are becoming more certain that Bertha will move to the east of Bermuda. The main effects will be some showers if the circulation expands and swell. Interests in Bermuda still should keep alert. Bertha has been fighting southwesterly wind shear today. This is a much weaker tropical cyclone than what we saw yesterday when the top sustained winds were probably around 125 mph. Just as fast as Bertha intensified, it has now weakened. It probably is barely hanging on as a hurricane or maybe just below hurricane strength. 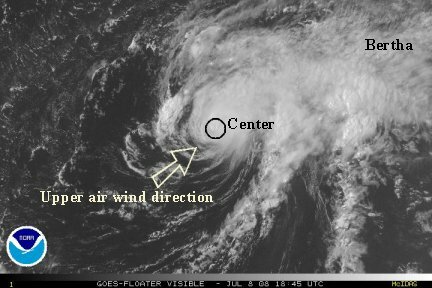 NHC will probably drop the winds down at 5 pm, but maybe not as low as us (70-75 mph). The forecasts still suggest a recurving east of Bermuda and this is by far the most likely scenario. A few other much less likely scenarios could develop. 1. If the wind shear sufficiently strips the convection off of the CDO (central dense overcast), then Bertha would move more with the low level flow, more to the west. This could put Bermuda in a more possible chance to receive effects from Bertha if it again restrengthened. 2. If Bertha re curves and the upper trough weakens. Bertha then may get picked up by the Azores high and rotate around it. 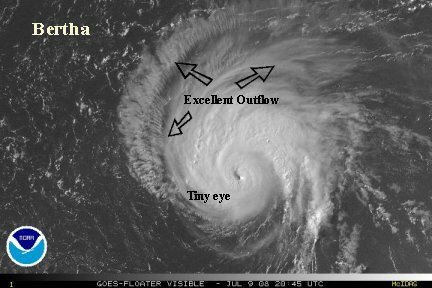 Bertha had weakened until Tuesday evening and started to make a small comeback. At its weakest point, Tuesday evening, top winds were probably about 70 mph. The wind shear slackened and deep convection once again burst on the west side of the circulation. A complete eyewall tried to form, but looks like didn't quite make it. The official NHC advisory has Bertha at 80 mph. After discussing this with a few colleagues, we think 70 is closer to reality after looking at the Quickscat and I.R. satellite imagery. The forecast track thinking really hasn't changed much. The most probable path would be east of Bermuda. Bermuda will get some swell on the south and east beaches, some gusty winds and some rain. That's the way it looks right now. 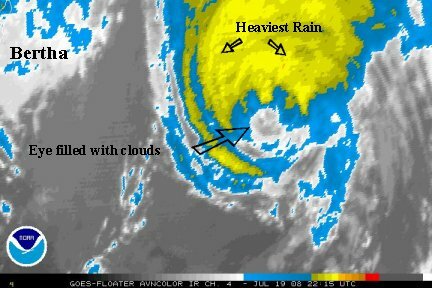 It really it amazing how fast the structure of a hurricane can change. 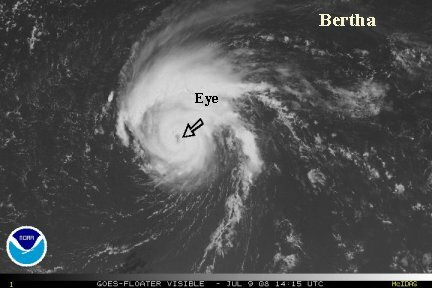 Over the past couple of hours Bertha has formed an eye again. NHC took the winds down to 75 mph at the 5 am advisory, not doubt, it is on a strengthening phase again. It usually takes a little time for the winds to come up, but a 75-80 mph range is probably what we are looking at. 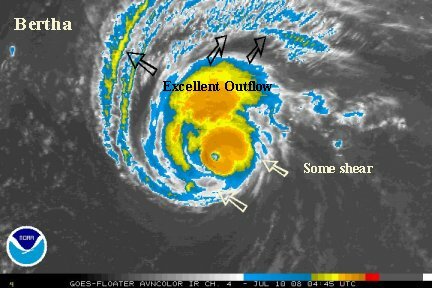 The forecast models just aren't good enough to predict the effect of shear and other factors on the strength of a hurricane. No changes on the track - still looks like east of Bermuda. Bertha should slow down as steering currents relax, then move more northeast with the next trough. Bertha is undergoing rapid deepening again today. The latest satellite imagery shows excellent outflow on the northern semicircle. The eye is well formed and the CDO is donut shaped again. The winds are probably close to 115 mph. Small tropical cyclones like Bertha can strengthen and weaken much more quickly than larger hurricanes. That is a huge jump just like a few days ago. Bertha will be entering warmer ocean water over the next day or two, so it may stay strong a while. This time the steering currents aloft should be weakening so shear probably won't tear it apart like last time. NHC will likely not jump that high on their 5 pm advisory. They usually slowly ramp up or ramp down wind speeds. There are no new microwave satellite estimates at this point. The forecast track guidance is still taking Bertha northwest, then north about 100-200 miles east of Bermuda. 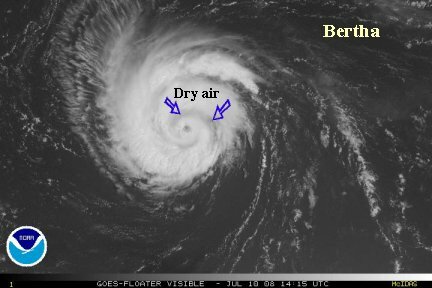 Interests in Bermuda should still follow Bertha closely. Bertha is still intensifying. NHC brought winds up to 105 mph on the 5 pm advisory. A microwave estimate finally came in. It estimated 110 mph at 3 pm today. Since the last update two hours ago the eye continues to contract. I think we are quickly approaching the strength of two days ago. We would guess 125 mph about now. This is a small hurricane still and its swell generating power is not as significant unless the size of the wind field expands or the winds stay high for a long period of time. No change in the forecast track. Bertha has been fighting some southerly shear again this evening. It probably maxed out on top wind speed this afternoon when the eye was smaller and placed in the center of the central dense overcast. The max winds at that time were probably 115-120 mph. Our earlier estimate was just a bit too high. The most recent microwave wind estimate was 100 knots or about 115 mph. At this time with eye going through cycles of fighting off shear we think NHC's estimate of 105 mph is close. The top winds still may fluctuate over the next couple of days some, but stay close to the present wind speed as it gets into a weaker steering pattern. 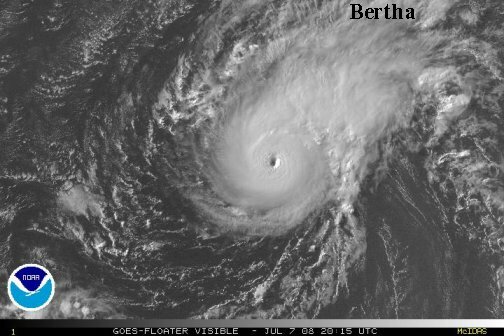 Bertha is about 580 miles southeast of Bermuda. The wind field is expanding and likely will effect Bermuda. Bertha may stall or nearly stall 100-200 miles southeast of Bermuda. This will allow for some rain squalls, high surf on the south and east facing beaches. The forecast models are still calling for a more northerly motion that will take Bertha slowly away from Bermuda early next week. 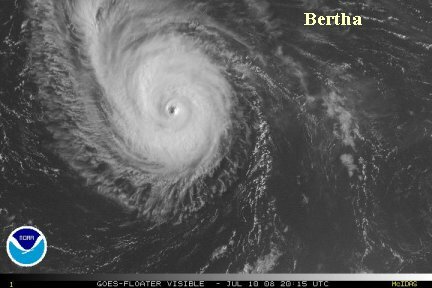 Bertha is about 485 miles southeast of Bermuda. It is moving northwest only at about 9 mph and may slow down over the weekend. Bertha has ingested some dry air and looks to have lost some wind speed. NHC's 90 mph winds on the last advisory match up fairly well with the microwave satellite estimates. Wind shear looks to have weakened and good to excellent outflow aloft is noted on all quads except for the southeast. Bertha's size is also growing. This is common as a hurricane moves into the subtropics. Because of this, even it passes 100-250 miles east of Bermuda, they may get rain squalls and maybe tropical storm force wind (39-73 mph) gusts. The forecast models are all still grouped about 100-250 miles east of Bermuda. It should slow down over the weekend and then pick up more speed with the next trough early next week. Bertha is getting stronger again and expanding in size. 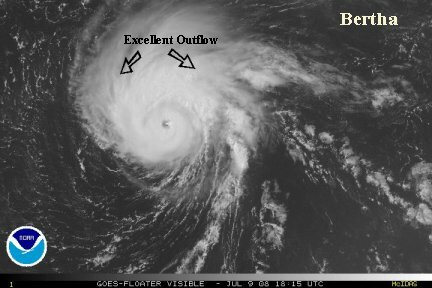 At 4:45 pm edt Bertha was about 27.2 N / 60.8 W or about 425 miles southeast of Bermuda. It is still moving northwest 10 mph. It is now taking on a "classic" hurricane shape. Top sustained winds are probably about 100-105 mph and looks to possibly strengthen back to cat 3 tonight. Nothing new on the forecast track. Slowing down at moving about 150-250 miles east of Bermuda. Bermuda may get tropical storms winds, rain squalls and high surf in excess of 15 feet on the south and east facing beaches. Interests in Bermuda should follow Bertha closely for the track and further strengthening possibilities. ***NHC just gave an estimate of top sustained winds of 85 mph Microwave estimates a couple of hours ago were around 100 mph. Quite a lot has happened since the last update. 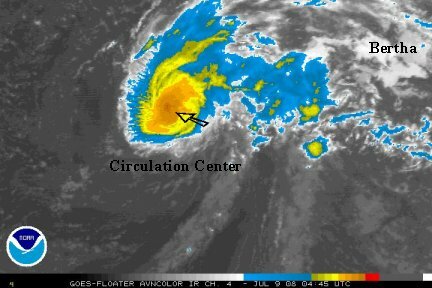 It looks like Bertha's strengthening phase quickly ended Thursday evening when dry air was ingested into the circulation. Since that time even more dry air has entered the circuatlion and has essentially destroyed the eye. A much larger circulation is now evident on the satellite picture which looks to become the new eye. The latest microwave estimate from earlier this evening placed the strength at 85 knots. No doubt the weakening trend has continued since then. NHC's 11pm edt maximum sustained winds of 85 mph looked good for earlier this evening. It's possible that the winds will be lowered some more at the 5 am edt advisory. The forecasts tracks have a new twist to them. Some of them are moving Bertha more east (away from Bermuda) as the steering currents get weaker this weekend. After that Bertha finally starts moving more northeast again. 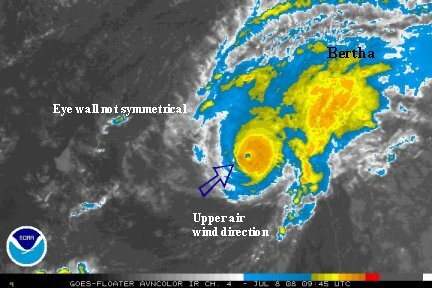 At this point, Bermuda still needs to follow the progress of Bertha carefully. Rain squalls and tropical storm force wind gusts (39-73) are still possible as Bertha moves to the east of Bermuda. Swell generated will mostly effect the south and east facing beaches. Some surf may be as high as 15 feet. As per our announcement on the message board, TropicalWeather.net will not be posting hurricane update this coming week unless a land mass will be affected. This will be the last update on Bertha, unless there is a significant change in the forecast track or conditions effecting Bermuda. The latest forecast models have Bertha all moving rapidly northeast the next few days as it becomes extratropical. There is a zone from over Iceland to a few hundred miles south of Iceland of where Bertha is expected to pass. By that time, it will not be important to focus on the center of circulation that much as the wind field will be quite large.